The Waterways Board Policies, Rules and Regulations state that the entire Inner Harbor is a "no lobstering" area. 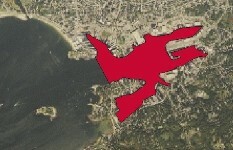 This map illustrates the designated area. It starts from a line between Cape Pond Ice and Rocky Neck and includes all of the Inner Harbor. Please select the map on the right to view a larger image. For more information about designated lobstering areas, please contact the Harbormaster Department at 978-282-3013.